The director of the Prison Reform Trust praised the inspiring prisoner resettlement scheme based on the Dartington estate as a ‘bright star in a rather dark landscape’, at the project’s second birthday in September 2015. 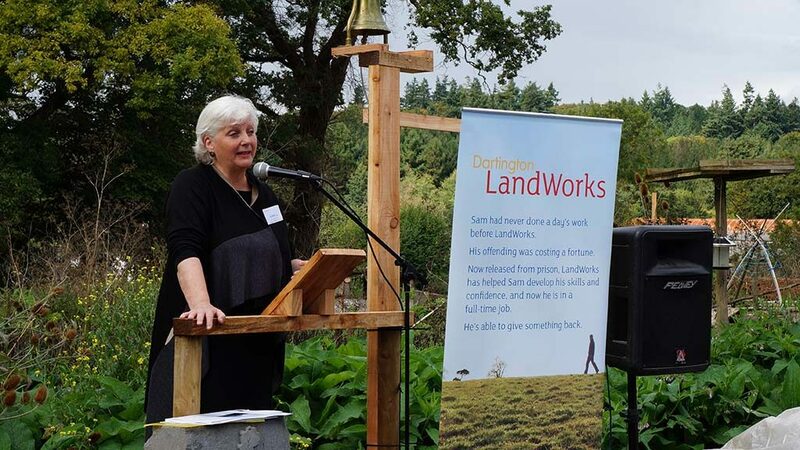 Juliet Lyon CBE met current and former prisoners on the LandWorks scheme – who are referred from HMP Channings Wood and the ‘TurnAround’ joint probation and police partnership. In its two years, LandWorks has supported 24 current and former prisoners to find more purposeful lives away from crime, with eight having found full-time employment to date. Attending the anniversary were over 150 of the project’s network of 800 supporters, who are central to the scheme’s innovative model as they provide trainees with the all-important networks and contacts they need to move on in life. In 2015, volunteers and supporters have also raised over £100,000 in community donations and helped secure a grant from The Big Lottery Fund providing 60 per cent of the project’s funding for the next three years. “We have become a prison-obsessed society and that’s not fair, proportionate or productive. So, when you get the opportunity to see something fresh like LandWorks, to see men working in a way that satisfies them and satisfies others, where they then can leave here and earn a proper living in society, it is really brilliant. The scheme helps current and former prisoners to develop the skills and confidence they need to choose a life away from offending, to find a job and play a positive role in our communities. Work-based training such as landscaping, market gardening, and carpentry goes hand in hand with developing life and social skills, and building self-worth. Around £37,000 a year of tax-payers’ money is saved for every LandWorks trainee who does not reoffend and return to prison.